WCHA RinkRap: Are The Minnesota State Mavericks Simply Too Good? Are the Minnesota State Mavericks too good? It is no secret that WCHA commish “Billy Rob” Robertson yearns for three teams from his league to make the NCAAs. We are now in the stage of the season to project how these things play out, and based on college hockey’s PairWise Rankings—the ultimate criteria for NCAA admittance—the only way for Billy Rob’s dream to be realized is for Minnesota State to get upset in the WCHA tournament and have someone other than Bowling Green get the automatic bid from winning the WCHA tourney, say Lake State or Bemidji. Predicting a Minnesota State loss in the WCHA requires a long walk on thin ice: the Mavericks lead the nation with 23 wins and have an 11-point lead in the race for the MacNaughton Cup. 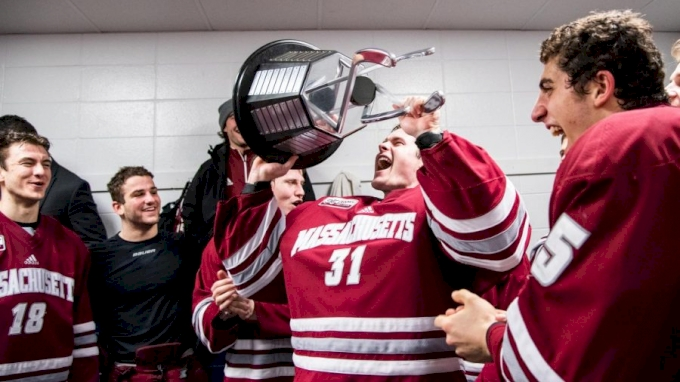 They’ve won nine out of their last 10 games and have become college hockey’s answer to a Flying Circus, with a power play percentage well over 20 percent and many of their goals of the spectacular variety. 🚨🏒GOAL. OF. THE. YEAR.🏒🚨@MavHockey and Ian Scheid look to put on another show tonight in a @WCHA_MHockey showdown. The Mavs had more to celebrate than just their sweep over Alabama Huntsville this weekend: four-year standout Teddy Blueger finally broke into the Pittsburgh Penguins NHL lineup and scored on both Friday and Saturday night. Hastings is having a season for the memory vault: guiding Team USA to a World Junior silver medal in Vancouver while leading the NCAA in wins at Mankato. He is trying to breathe the rarified air of those coaches who get to the IIHF medal stand and reach the NCAA Frozen Four. Getting to college hockey’s final weekend in Buffalo would make the Mavs the first WCHA squad to reach the Frozen Four since college hockey’s seismic realignment in 2013. That appears far more likely than a potential upset in the WCHA playoffs. The Lakers have crept up the WCHA standings into third place and have an excellent chance to lock up home ice for the WCHA quarterfinals in March. Their crucial RPI rankings have them on the dark side of the NCAA “bubble,” but that could all change if they can get to the WCHA Championship Game. It is a squad loaded with upperclassmen and an elite coaching staff, and they’ve acquired hard-earned confidence from knocking off a slew of ranked teams. It’s been almost a generation since Taffy-Abel Arena has played host to post-season hockey. The Lakers have a bye week to regroup for what could be an historic push. Bowling Green has not been to the NCAA playoffs since 1990, although it has been tantalizingly close in recent years. This was supposed to be the season the Falcons broke the door down, especially after sweeping Minnesota State in December. But the new year has brought a spate of .500 hockey, as their rankings slowly drop closer and closer to the cutoff mark for the final 16. Northern Ohio is becoming known as “Splitsville,” as the Falcons have split their last five series. Their last one came via an honorable effort up at Northern Michigan, as the two rivals battled for 120 minutes in 26 hours, a series that could have been a sweep for either side with just an extra smidge of puck love. The Falcons’ illustrious NHL alums, guys like Rob Blake, George McPhee and Gary Galley, are now all watching college scores every weekend, willing their alma mater back into the national tournament. They are pulling hard for the program they invested in back in 2009, when Bowling Green was in danger of dropping hockey as a varsity sport. Bergeron has BGSU headed for their fifth straight 20-win season, but they cannot simply glide into the NCAAs. His Falcons need to exit “Splitsville” and run the table, they must secure home ice until the WCHA Championship game with a second-place finish if they are to keep the reins on this season. Falling into third place could force them to win a semifinal series in the Upper Peninsula, potentially shattering their NCAA dream once again. Author Tim Rappleye just released his latest book: Hobey Baker, Upon Further Review (Mission Point Press, 2018). He can be reached @TeeRaps.